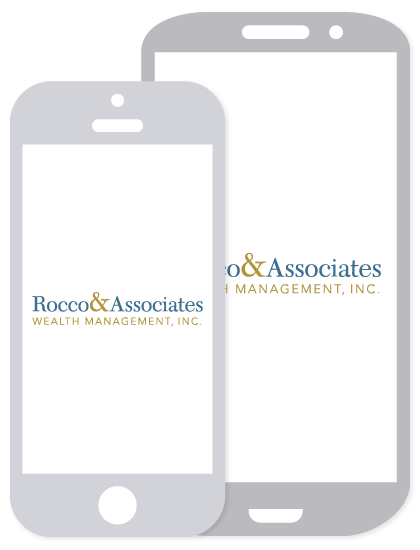 Around The Office - November 2017 | Rocco & Associates Wealth Management, Inc. Although we encourage all of our clients to give back to their communities throughout the year, each November leading up to Thanksgiving the idea always takes center stage. Last year, charitable giving topped over $390 billion! Giving to all nine major categories of recipient organizations grew, making 2016 just the sixth time in the past 40 years that this has occurred. The nine categories are: religion, education, human services, foundations, health, public-society benefit, arts, culture and humanities; international affairs, and environment and animals. 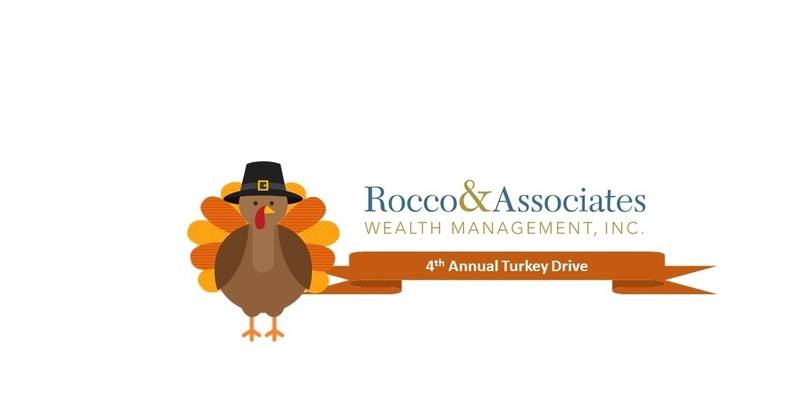 During the entire month of November, our firm will be focused on giving. Our blogs and social media content will also focus not only on the good will of doing so, but also at times the financial benefits. Should you have any questions about how making certain charitable contributions may benefit your overall financial plan (and your favorite charities), please do not hesitate to reach out to the office! Help us toward the goal of alleviating hunger in Connecticut this Thanksgiving! Nearly half a million people in the state of Connecticut are hungry, and 1 out every 6 children is food insecure. Every year, the number of Connecticut residents who rely on the Connecticut Food Bank and its partner food-assistance network grows. In keeping with the theme of giving for the month of November, we will be holding our Fourth Annual Turkey Drive in partnership with the Connecticut Food Bank and this year we have made it even easier to donate. Simply visit our website and click on the “Events” tab or the sidebar widget, where you will be directed to our virtual food drive. Rocco & Associates will match, dollar for dollar, every donation you make. Your contribution will help insure no family goes hungry this Thanksgiving in Connecticut! As a point of reference, for every $10 donated to the Connecticut Food Bank, we can feed one individual for an entire week! Your constant generosity in year’s past is so very much appreciated. Every holiday season we invite our clients and partners to join us at our Annual Holiday Reception so that we may share in some good company, conversation and cheer. It also gives us time as a firm to reflect on the past twelve months and how we are all so fortunate to be able to do what we love. Working closely with all of our clients to assess, design and implement long term financial plans to assist in reaching financial goals and objectives is our passion and we don’t take this responsibility lightly. 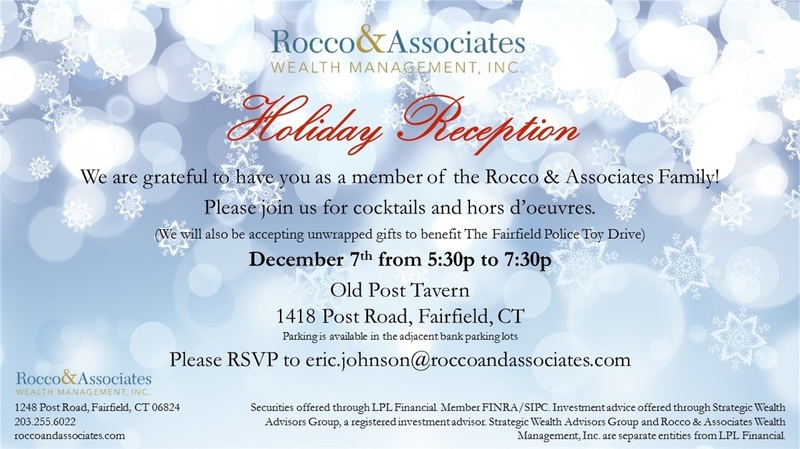 So be sure to stop by Fairfield’s Old Post Tavern (1418 Post Road) on Thursday December 7th from 5:30pm-7:30pm and help us ring in the holiday season. This year we will be partnering with the Fairfield Police Department collecting unwrapped toys to benefit children battling cancer. As the holiday draws near we will also be assisting to distribute the toys directly to those in need at St. Vincent’s Hospital in Bridgeport. This year we are encouraging our guests to bring along a friend, coworker or family member that may be able to benefit from an introduction to our team. To RSVP email [email protected]. We hope to see you all there!